Barbara Strigel and Shirley Wiebe address Vancouver’s changing urban landscape in Double Vision. Working in the tradition of street photography, Strigel explores the idea that the built and perceived spaces of the city exist both simultaneously and separately. Meanwhile, Wiebe’s focus is on how people and communities live, work and create meaning in the context of a city. 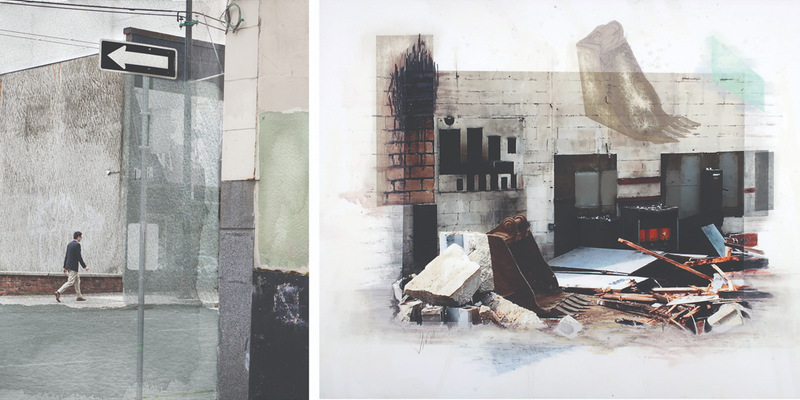 Her mixed media photographic works, which attempt to go beyond a sense of detached neutrality, are direct responses to specific architectural spaces. Together, the works in Double Vision present two ways of seeing Vancouver, one standing at the edge and the other moving beyond the frame. Barbara Strigel is a photographer and book artist living in Vancouver, BC. Her work is informed by the ways that cities facilitate a common sense of place, and explores the idea that the recognition of a stranger’s familiar gesture reduces our perception of the scale of space. Shirley Wiebe is a visual artist working across media. The ongoing focus of her work is human geography as it relates to place, memory, and history. This takes Wiebe out of the studio and into the community, where she explores the links between environment and identity, forming a continuous thread of questioning in these studies.